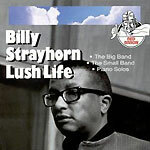 This 1965 album was produced by Duke and Mercer Ellington to showcase the talents of Duke's arranger/composer extraordinaire Billy Strayhorn. Interestingly, not all the songs here were written by Strayhorn; perhaps the message Duke wanted to convey was that Strayhorn was also a gifted pianist, able to evocatively interpret others' works. Still, the Strayhorn take on Strayhorn songs provide the best moments here. Especially rewarding is the title track, recorded live at Basin Street East in New York City, which features a rare vocal by Strayhorn (and he sounds not too far off from Nat "King" Cole." Ellington put together a stellar supporting cast, of course, including Clark Terry on trumpet and Ozzie Bailey on vocals. But it also seems fitting that the album closes out with Strayhorn on solo piano performing three pieces  one co-written with Ellington, one by Ellington, and the last by Strayhorn himself.